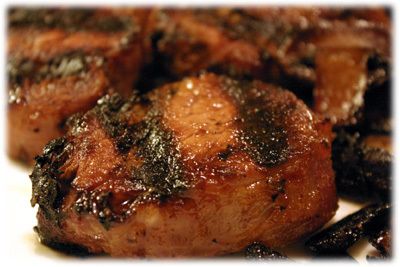 Most grilled pork tenderloin medallion recipes I've found are pretty easy to make and this one's made even easier with our Apple BBQ Sauce recipe. 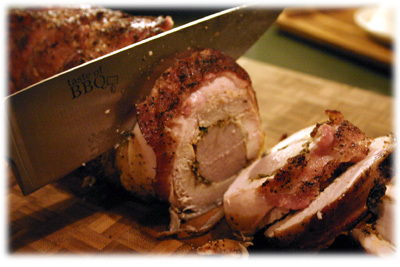 It's great because this particular barbecue sauce is also a powerful pork tenderloin marinade that infuses the pork medallions with pure Apple BBQ flavor. 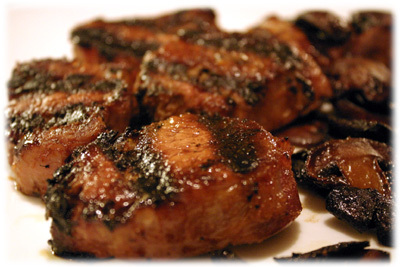 In the picture above, the grilled tenderloin medallions are hot off the grill and if you look closely you'll see they're served with our new Balsamic fried mushroom recipe on the side, what a great combination. If you have the time then marinate the medallions in the homemade apple bbq sauce overnight, if not 2 - 3 hours will do. Note: for best results marinate 2 hours up to overnight. 1/2 cup Apple BBQ Sauce homemade recipe. Tip: you'll be serving 4 to 6 (1" thick) medallions per person. 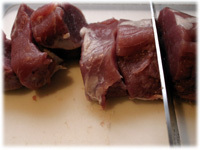 When you buy the pork tenderloin visually calculate how many 1" thick medallions the piece will provide and buy more or less according to how many people you'll be serving. 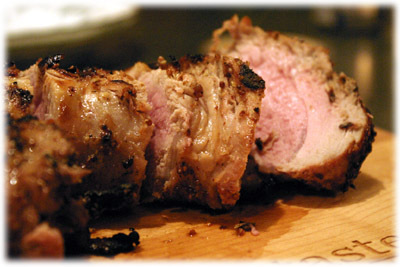 Slice the pork tenderloin into 1" thick medallions. 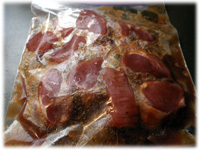 Place the tenderloin medallions in a resealable plastic bag and pour in enough apple bbq sauce to completely cover them (1/2 to 3/4 cup). Place the bag in a shallow dish (in case the bag leaks) and place it in a refrigerator for 2 - 3 hours and up to overnight. Clean and oil the grates of the BBQ and preheat to 500F - 525F. 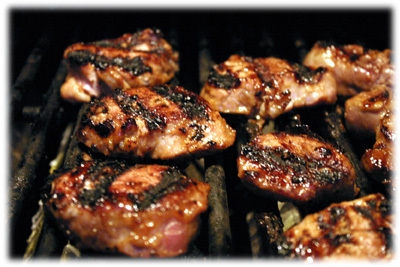 When the grill reaches this temperature range remove the medallions from the marinade and place them on the grill and close the lid. After 5 - 6 minutes lift the lid and check the underside of the medallions, they should be showing nice grill marks and getting crispy brown - go ahead and flip them over. 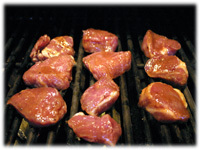 After another 3 or 4 minutes the tenderloin medallions will be cooked (internal temperature 145 - 150F) and can be removed from the grill and served immediately.